The goal of this document is to guide you to setup navigating humanoid characters to move using the navigation system. 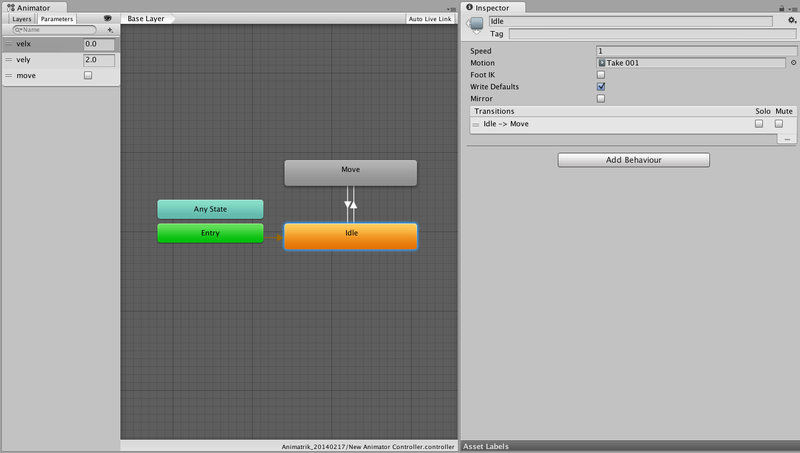 We’ll be using Unity’s built-in systems for animation and navigation along with custom scripting to achieve this. It’s assumed you’re familiar with the basics of Unity and the Mecanim animation system. To get a responsive and versatile animation controller — covering a wide range of movements — we need a set of animations moving in different directions. This is sometimes referred to as a strafe-set. In addition to the move animations we need an animation for the standing character. For blending control we add two float parameters velx and vely, and assign them to the blend tree. See in Glossary for running on the spot. The latter is highlighted in the center of the 2D blend map below. The reason for having an animation running on the spot is two-fold, firstly it preserves the style of running when blended with the other animations. Secondly the animation prevents foot-sliding when blending. 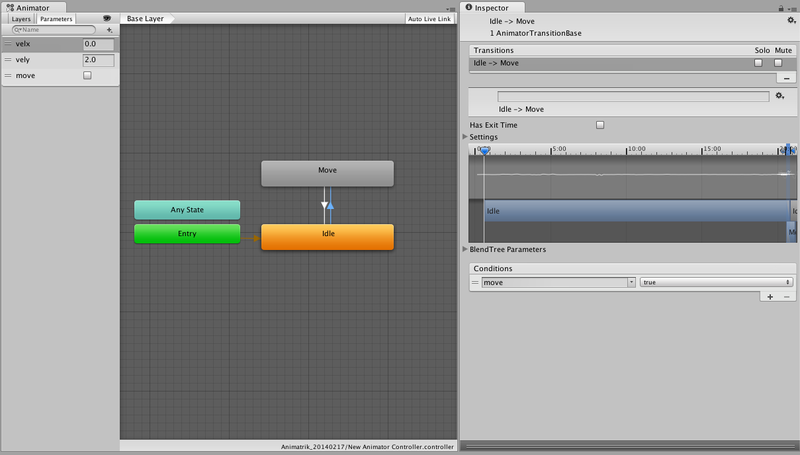 Then we add the idle animation clip in it’s own node (Idle). We now have two discrete animation states that we couple with 2 transitions. To control the switch between the moving and idle states we add a boolean control parameter move. Then disable the Has Exit Time property on the transitions. This allows the transition to trigger at any time during the animation. Transition time should be set to around 0.10 second to get a responsive transition. Now place the new created animation controller on the character you want to move. See in Glossary and change the move state and velocity. See in Glossary you’ve placed the character in. Next we need to tell the character where to navigate to. This typically is very specific to the application. Here we choose a click to move behavior — the character moved to the point in the world where the user has clicked on the screen. Pressing play now — and clicking around in the scene — you’ll see the character move around in the scene. However — the animations don’t match the movement at all. We need to communicate the state and velocity of the agent to the animation controller. To transfer the velocity and state info from the agent to the animation controller we will add another script. This script deserves a little explanation. It’s placed on the character — which has an Animator and a NavMeshAgent component attached — as well as the click to move script above. First the script tells the agent not to update the character position automatically. We handle the position update that last in the script. The orientation is updated by the agent. The animation blend is controlled by reading the agent velocity. It is transformed into a relative velocity (based on character orientation) — and then smoothed. The transformed horizontal velocity components are then passed to the Animator and additionally the state switching between idle and moving is controlled by the speed (i.e. velocity magnitude). In the OnAnimatorMove() callback we update the position of the character to match the NavMeshAgent. Playing the scene again gives show that animation matches the movement to as close as possible. To improve the quality of the animated and navigating character we will explore a couple of options. Having the character to look and turn towards points of interest is important to convey attention and anticipation. We’ll use the animation systems lookat API. This calls for another script. This will tell the LookAt script to set the point of interest to approximately the next corner along the path or — if no corners — to the end of the path. The character has so far been controlled completely by the position dictated by the agent. This ensures that the avoidance of other characters and obstacles translates directly to the character position. However it may lead to foot-sliding if the animation doesn’t cover the proposed velocity. Here we’ll relax the constraint of the character a bit. Basically we’ll be trading the avoidance quality for animation quality. When trying this out you may notice the that character can now drift away from the agent position (green wireframe cylinder) . You may need to limit that character animation drift. This can be done either by pulling the agent towards the character — or pull the character towards the agent position. Add the following at the end of the Update() method on the script LocomotionSimpleAgent.cs. Or — if you want the agent to follow the character. What works best very much depends on the specific use-case. We have set up a character that moves using the navigation system and animates accordingly. 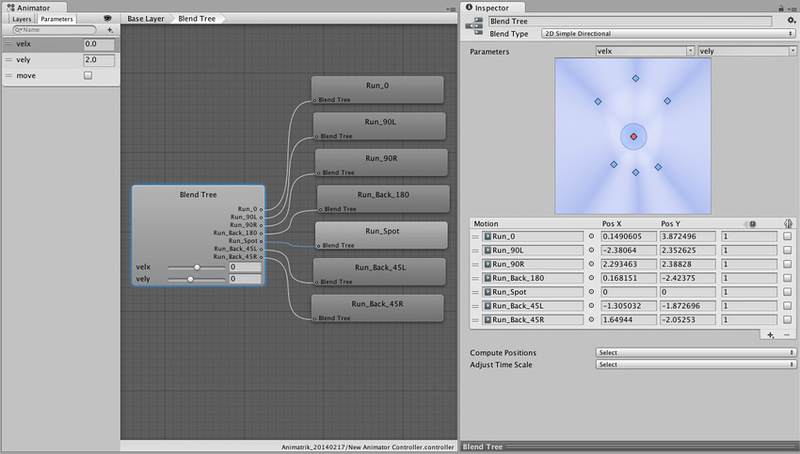 Tweaking the numbers of blend time, look-at weights etc. can improve the looks — and is a good way to further explore this setup.